New at Le Souk are the beautiful designs from by nord. by nord produces timesless home accessories of high quality. This Danish label has been founded by fashion designer Hanne Louise Roe Andersen and graphic designer Hanne Berzant. These two friends are inspired by Nordic nature which you see from their designs. The images above show Hanne’s beautiful home in Denmarkt (via Bo Bedre). 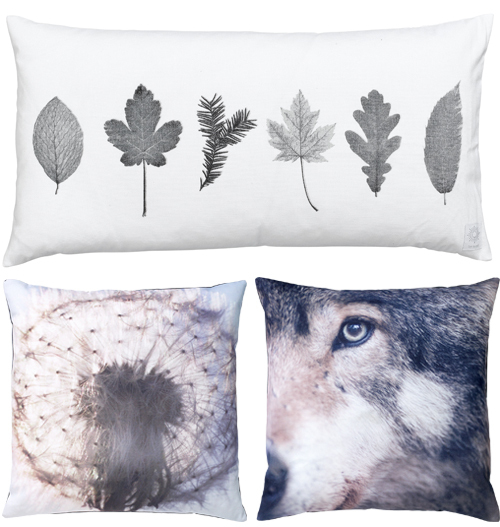 Bring nature into your home with these unique photo print cushions from by nord: pillow with leaf print (top), pillow with dandalion print (left), the pillow with wolf print (right) is available in two sizes (60x60cm and 80x80cm). 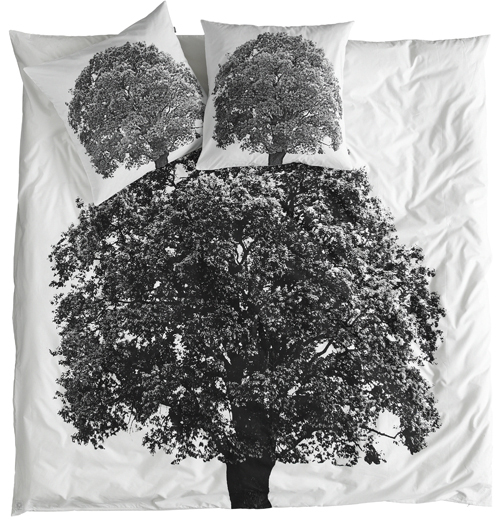 This gorgeous duvet cover with tree print is available in sizes 200x200cm and 200x220cm and comes with two beautiful pillow cases. I loove the red tables from the first picture! The pictures are awesome. Beautiful place. There’s always lots of white! mimetism with the snow outside. I really like the styling of the photos-so scandinavian. And the pillow with leafs print is pretty. Thanks for sharing! Thanks for sharing! Love this brand. I love these beautiful pillows on the couch. Thank you for sharing it with us. You are giving us the chance to see unique and elegant designs in a certain home. I hope to have one of those designs with my home.